It’s hard to believe my sweet baby will be 1 in just 2 months! From eating a regular meal with all of us to learning to stand without holding on, he is doing so much and growing up so quickly! This is a day late because I ended up putting my computer away yesterday and just enjoying the afternoon with my children. It was wonderful to do that and know that it’s ok to wait on a post like this. As I write this, I am sitting on our back deck (it’s a gorgeous 62 degrees – probably one of the last days we will have weather this nice!) and our fall snowstorm from 10 days ago would be almost forgotten if not for the small piles of snow in the shade. Luke is standing up, holding onto my chair, and “talking” to me as he goes from watching me to watching Nathan and Emily run around in the yard playing “clubhouse.” Joshua is napping, although he should be awake soon. So to my sweet Luke, who is now 10 months old! *You are 22 lb even and are wearing 6-12 months or 9-12 months clothing. You can still fit into some 6-9 months, but most of it is too short for you now. *Your big sister loves to dress you up whenever she can. You don’t usually mind except when it interferes with your crawling everywhere! *You are a great sleeper at night, sleeping from about 7 pm to 7 or 8 am. *You have been crawling for over a month and by the end of last month, you had started pulling up and standing while holding onto things. Now you do that constantly and your favorite thing to pull up on is Mommy. Of course this can be interesting when Mommy is trying to cut up chicken for dinner and can’t walk with you hanging onto her or move you because her hands are yucky! But it is very sweet! *You walk while holding onto things now. So you will hold onto the couch and walk along it to get to where you want to go. *You have started letting go and standing alone. You can now stand for about 20 seconds before losing your balance. Mommy can’t believe how quickly you are learning things! You have even taken one or two small steps while standing without holding on! *You eat lots of “regular” foods now, just cut up into smaller pieces for you. You love to eat dinner with everyone and are getting better at trying new things. 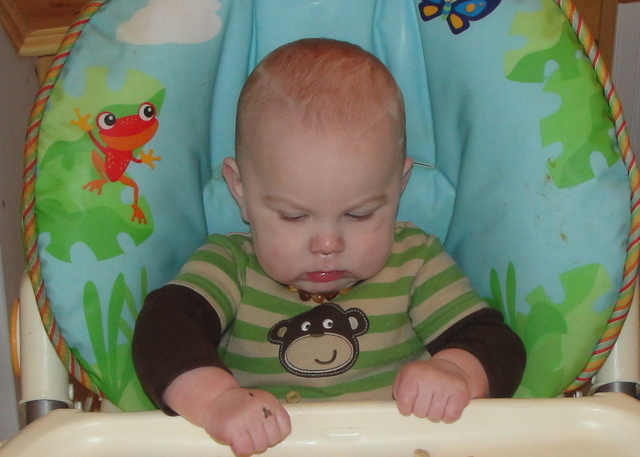 You are still learning to pick things up with your fingers and you mostly grab food with a fist and try to shove your whole fist in your mouth. *You have 2 teeth now; it’s your two bottom teeth! *You love music and dance and clap. One of your favorite things is when Mommy sings to you. You stop and smile at Mommy and if she is holding you, you put your fingers into her mouth. Lol. Of course this makes it harder for Mommy to sing! Your other favorite thing is the Veggies Tales theme song. You will stop whatever you are doing and crawl quickly into the living room and just stare at the tv and clap. *You LOVE water! Mom & Dad are shocked at how much you love it. Bathtime is your favorite thing in the world; you splash and go crazy and have so much fun. You don’t mind getting water in your face at all, in fact if Mom has the water running, you put your face into it and love it. You are also constantly trying to get to the dog/cat water bowl on the ground. This makes it fun for Mommy, especially when you do get to it because you splash like crazy and get water all over yourself and the floor. One more thing to keep Mommy very busy. *You say “Da Da” all the time. When Mommy put Daddy on speakerphone over her cellphone one day, you heard Daddy and started saying “Da-Da! Da-Da!” It was so cute. Mommy is still hoping you will say “Mama” soon. You have said it a couple times but not often and not enough for Mom to think you really know what you are saying. We love you sweet Lukey! Happy 10 months! So cute! They grow so fast. I need to post monthly updates on Sean. Great idea. They really do! You should post about Sean! It’s fun to think back on each month, plus it’s a date where I don’t put it off until next week and then it doesn’t get done at all! What a sweet post 🙂 I miss those baby days! !